From grades 9 through 12, I was fortunate to have three wonderful Latin teachers. 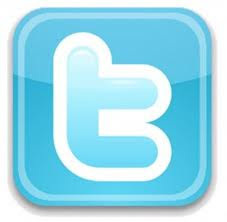 My first was Joyce Woller when I was a freshman, which in my day was part of the junior high. In my last post I wrote about how a friend and I walked each day from our junior high to the high school in order to take this class. Miss Woller was a good teacher, although I do remember being confused about interrogative pronouns and relative pronouns. She laid a good foundation of grammar using our textbook, Latin For Americans. In my sophomore and junior years, I continued Latin with Miss Alice Ranck. She was a legend around New Albany High School, and I quickly saw why. At first I was rather intimidated by her incredibly fast speech, but I adapted and came to love this lady who made Latin come alive. We continued our grammatical focus using the same textbook and made our way to Caesar in Latin II. Latin III saw us in Our Latin Heritage, which includes large selections of Cicero. Many students grow to love what their teachers love, and since Miss Ranck's favorite author was Cicero, he became mine as well. I thrilled to the oratorical pyrotechnics of the Catilinarian Orations and savored his philosophical works, such as De Senectute and De Amicitia. I have returned often, in both my teaching and in private life, to the eulogy of learning that is his speech in defense of Archias. 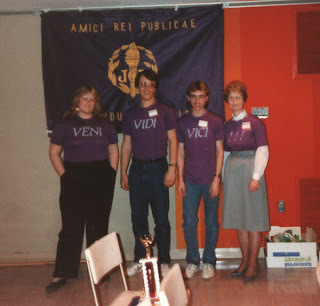 In these years with Miss Ranck, I discovered the Junior Classical League and an event called certamen. This is a team-based ancient knowledge game in which a team of four students with buzzers answers questions against two other teams. A toss-up for ten points can only be answered by the person who buzzes in, but the two bonus questions for five points each are answered in consultation with the team. With questions ranging from mythology to history to grammar, I loved it. Putting this together with local club meetings that included a Roman banquet and performances by the band of club members called Storm Front (I distinctly recall their rendition of Twisted Sister's "We're Not Gonna Take It"), I was hooked on Latin. It came as a great disappointment to learn that Miss Ranck was retiring at the end of my junior year to marry her high school sweetheart. While we all wished her well, we wondered what the future would hold. I could never have guessed that Miss Ranck's replacement, a young teacher from Illinois, would become a lifelong colleague and friend. Who would have thought that a junior high school assistant principal could have had such a profound effect? In New Albany, Indiana, the town where I grew up, my junior high served 7th, 8th, and 9th grades, and so it was at the end of my 8th grade year I signed up to study German the following fall. A scheduling problem developed over the summer, and the assistant principal of Hazelwood Junior High School, Mr. Edwin "Skip" Ellmers, called my parents to suggest an alternative. He recommended taking Latin, but I would have to walk a few blocks each day to New Albany High School in order to do so. He made the recommendation because he wanted me to have the opportunity to experience the Latin teacher, Miss Alice Ranck, who had been such a great influence in his own daughter's life. My parents and I talked it over, and we agreed for me to take Latin the coming fall. As it turned out, I did not have Miss Ranck for Latin I, but Joyce Woller. She was a fine teacher, and a friend of mine, Mark Hawkins, and I walked each day from Hazelwood to NAHS and back again so we could study Latin. It turned out to be a life-changing decision. I studied Latin for four years, grades 9-12, majored in Classical Studies at Indiana University, and went on to earn a Masters Degree in Classics from The University of Texas. I met my wife in Latin prose composition class at I.U., have taught Latin for more than twenty years at every level from middle school through undergraduate, have published numerous articles and books related to Classics, and now have the opportunity to share ancient history via my various Roman personas. In upcoming posts, I will share more about the Latin teachers and Classics programs from whom I have been blessed to learn. For now, I would like to thank Mr. Ellmers for calling the family of an 8th grader one summer to make a scheduling suggestion. That phone call has touched countless lives. Crastinus found some great recruits at the Illinois Junior Classical League convention at Pekin Community High School last Saturday. 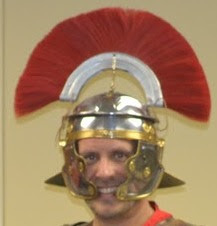 After laying out the responsibilities and rewards of serving with the eagles of Rome, Crastinus recruited a number of students to the stage to try out the armor and drill to some basic commands. These recruits were chosen from those who correctly answered questions about the presentation, and there were plenty to choose from. At the end, students who follow Roman Personas on FB and Twitter got the chance to battle with foam swords on stage. The winner went up against Crastinus, but quickly learned how difficult it is to get around a huge Roman shield! Pekin did a tremendous job hosting the convention, and it was a great pleasure to talk with several teachers and students from around the state. I was particularly impressed with one Pekin student who told her friend, who was helping me carry equipment to my truck, that he was holding the shield with the wrong hand. Clearly she had been listening to Crastinus! I owe the biggest thanks to Marcene Farley, the Latin teacher at Pekin Community High School and sponsor of her school's chapter of JCL. It is easy to see not only that her students love her, but why they do. Tu es magistra optima et maxima! A few pictures are below, but you can see the full album of pics from this event at www.facebook.com/romanpersonas. Check back soon for a post about how all this got started...the back-story of Gaius Crastinus, if you will! See you on the battlefield! I am very excited to be presenting Gaius Crastinus next Saturday at Pekin High School in Pekin, Illinois! My good friend and colleague, Marcene Farley, is hosting a regional Latin convention and despite the fact that I have spoken at this event twice before, she has invited me back, this time as Crastinus. Perhaps it is precisely because I will be someone else that I got the invitation! Marcene was my Latin teacher for my senior year of high school, and we have remained friends ever since. I had the good fortune of having three Latin teachers during that time. When I was in ninth grade, which was part of our junior high, a friend and I walked to the high school each day to take Latin from Joyce Woller. My sophomore and junior years, I had Alice Ranck. She retired at the end of my junior year to marry her high school sweetheart, and Marcene became our new teacher. She took another friend and me, along with my mom, to the state Latin convention that year, and my friend and I won the upper level certamen! That friend posted this picture to Facebook a few years ago. It will be an honor as well as a pleasure to present Crastinus at Marcene's school next weekend. She is a great teacher, and her students are quite fortunate to have her. 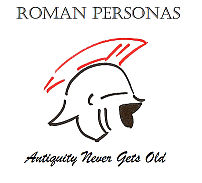 On a separate note, do check out the new Facebook page for Roman Personas. It has lots of pictures and other fun stuff related to ancient Rome.